Marie Bell was a French actress whose career lasted 60 years. 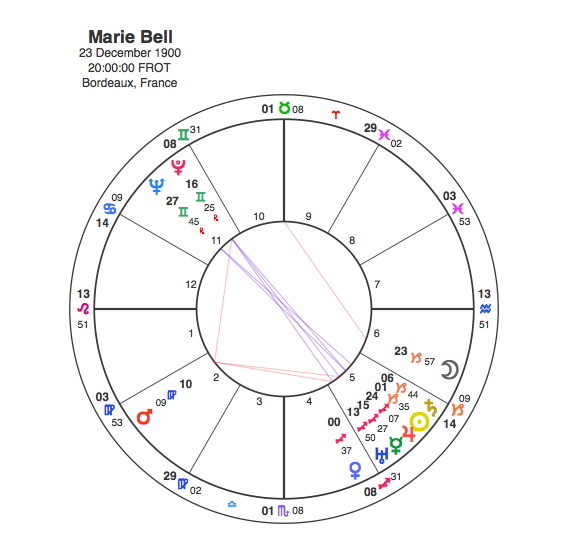 The most striking thing about her chart is the 5 planet stellium in the 5th house. The 5th house as strongly associated with creativity but with acting in particular. The reason for this is its connection to the 5th sign, Leo which is noted for its dramatic expression and a tendency to live life as if on stage. Bell’s acting skills encompassed a wide range of roles as indicated by the various planets in her 5th house. She was mainly known as a classical actress who performed many tragedian roles. This is symbolised by her Sun in the traditional sign of Capricorn in conjunction to the serious and in many forms, tragic Saturn. She also took on comedy roles and appeared frequently as a dancer, both associated with Mercury. She was not afraid of appearing in pieces of avant-garde theatre, Jean Genet in particular a trait suggested by Uranus. Bell also was a success as a stage director as shown by Jupiter. Bell’s Sun is opposite Neptune, the planet of fantasy and illusion and many actors of her era had strong Sun / Neptune contacts. Neptune and Pluto are in the 11th house of politics in opposition to her 5th house planets and she was actively involved with the French Resistance during the war, and was awarded the Legion of Honor by General de Gaulle. Marie Bell’s long career began as a dancer in 1914 at the age of 13 as Pluto was opposite her Sun. She finally retired when Pluto made its only other aspect to the same body, a square in 1973. Her acting career was clearly described by her 5th house stellium and was bookended by Pluto’s transits.